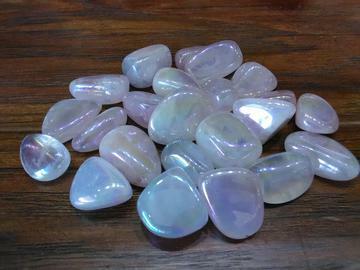 Fantasy Rose Aura Quartz (Angel Aura Rose Quartz) is a treated rose quartz fused with Titanium to produce a romantic and vivid gemstone in brilliant hues of pink. This gemstone is a stone for romantics as it acts like a prism within you to touch upon your true love, pure love and the feelings you have related to passion. This gemstone allows you to feel love more intensely and to create stronger bonds with those you love. This stone can provide vivid and realistic dreams about the fantasies you have and can bring about spontaneous, romantic whims. The energy within this stone is light, happy and provocative.